There's so much happening in the world of mobile computing, that it's easy to forget that the advances that underpin the latest releases also help out at the serious end of the market. Lenovo's ThinkCentre M92p Tiny is on hand to try to get you to rethink this stance. Like many big players, Lenovo offers a full range of computers of varying sizes depending on what you're looking for. Its ThinkCentre series alone comes in several flavours - ranging from the enterprise-focused M Series towers, through to the business-class Edge Series all-in-ones. Lenovo describes its M Series Tiny range of PCs as 'full-featured micro desktops', and sure enough straight out of the box, the tiny footprint of the Lenovo M92p Tiny system is impressive. It's a little bigger than some micro machines - it's notably thicker than the Lenovo IdeaCentre A190, for example - but it's still a mighty small machine. It's a little larger than the straight base unit, since it has an optical drive piggy backed on top, with the whole thing held in a chassis. Even so, you're still looking at an incredibly svelte system - and as the optical drive draws power from the main PC, you don't have any unnecessary additional power cables either. Lenovo supplied the £595 / US$629 / AU$1,209 ThinkCentre M92p Tiny with a range of accessories to show off the system's flexibility, although in truth we can't help wishing that it hadn't. The laptop-style keyboard feels cheap and nasty, while the USB screen (a marvel in its own right), is no replacement for a proper panel - and again comes across as a poor laptop knock off, rather than a brilliant addition to the flexibility of the tiny unit. The fact that all of this came supplied in a fairly hefty piece of luggage may attempt to demonstrate how portable a tiny machine like this can be, but in practice it only makes you wonder why you'd look at this over any number of laptops. Raw performance maybe? This decision also highlights a major point against the Lenovo M92p Tiny's existence - in these days where we're all being asked to be more mobile, do we even need desktops for business any more? A machine this small potentially has a place next to (or under) your television, but what does it offer serious users? The Lenovo M92p Tiny is... well, tiny, and that does limit the choice of components that can go in it. You'd think then that a desktop processor would be non-starter, but that's exactly what Lenovo has installed in this unit. To be fair, this is a more power-efficient chip than is the norm, with a thermal design power of just 35W, but it's still good to know that you've got a decent chip to hang your performance off. The Intel Core i5-3470T that you'll find inside that tiny chassis boasts a pair of physical cores, but also comes with hyper-threading, which equates to four cores altogether for handling your multi-threaded applications. This chip has a default clock speed of 2.90GHz, but is capable of turbo charging up to 3.6GHz. This last-generation chip has 3MB of smart cache to call its own and can access up to 32GB of RAM. This processor is responsible for graphics capabilities of the PC as well, although the Intel HD Graphics 2500 set isn't a particular highlight of what Intel is capable of - and indeed even for a last-generation processor, it's hardly pushing the envelope much. There are some interesting decisions at play in the Lenovo M92p Tiny, with Lenovo electing to equip the machine with Windows 7 and not the newer Windows 8 (let alone Windows 8.1). To be fair though, there's little of interest for businesses in Windows 8, so it's not a decision that we're going to hang Lenovo out to dry on. We're less enamoured by the decision to ship the machine with the 32-bit version of Windows 7 though, since this limits the amount of RAM that the operating system can access. And given the current low-low price on RAM, this seems a limitation that is arbitrary. Our test unit had 2GB of RAM installed, but since the integrated graphics need a piece of this for themselves, that's not an impressive amount. Given that the likes of the Lenovo IdeaCentre Q190 ships with a 1TB hard drive, it's somewhat surprising to find there's such a small hard drive to be found inside the Lenovo M92p Tiny. On paper our model came with a 320GB hard drive, but once formatted and partitioned with room for the recovery partition, you're looking at well under 300GB of free space. A 500GB hard drive option is available, though, as well as a 128GB or 180GB SSD. You will at least find most of your connectivity options covered, with integrated Wi-Fi - complete with an external antenna to help maintain a good connection - along with an RJ45 port for wired connections. There are five USB ports on the base unit too, with the optical drive boasting another two (although it takes up one port on the base unit in order to do so). There's also a Kensington lock for security when you're out and about. The performance of this machine, in the straight benchmarks tests, is exactly where we would expect this collection of components to reside - a little off the pace maybe, but not a million miles away. The Intel Core i5-3470T chip is a capable dual-core processor with hyper-threading, which means that it can handle multi-threaded applications well. The default clock speed of 2.9GHz is healthy enough for single-threaded applications as well, and means that the chip can put in a good turn of speed across a range of uses. The Lenovo Tiny M92p's processor is responsible for the graphics side of things too, although the Intel HD 2500 subsystem lacks the raw silicon to do anything particularly interesting with modern gaming titles. To be fair though, this isn't a games machine, nor is it intended to be used as one even as an aside, so it's no surprise that the performance garnered from it was unspectacular. However, it wouldn't even start running the latest 3DMark 2013 benchmarking - crashing out with an error straight away. Despite the benchmarks producing reasonable results, the experience never felt quite so convincing in actual use. Indeed we'd go as far as to say that the end user experience was pretty awful, with slow loading times, sluggish overall performance and the general air of a machine that really wasn't pulling its weight. We'd suspect that the decision to install a 32-bit version of Windows doesn't help here, nor the fact that there is less than 2GB of usable memory onboard. You may not think this is a big deal, but the limitation on the RAM available really does have an impact. Most iterations of the M Series Tiny family use Windows 64-bit and come with 4GB of RAM as standard, though, so there's a limit to what we can draw from this experience with respect to the rest of the brand. 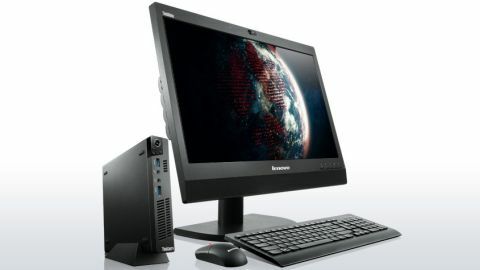 Just as important for such a small machine are the connectivity options available - here the Lenovo ThinkCentre Tiny M92p has up and downsides. You will find five USB ports for instance, which is fine, but not all of them are particularly easy to access - the fifth can be found under the Wi-Fi aerial, and it's hard to even see, let alone to connect a device to. It's on the display front that the most frustrations can be found, though - Lenovo has equipped the machine with a legacy VGA connector and a DisplayPort, which is hardly common. There's no sign of the more regularly supported DVI or HDMI connectors, which means you'll be reaching for a dongle just to get the machine up and running. The Lenovo ThinkCentre M92p Tiny is a little computer that is solid enough to withstand the knocks and bangs that you can easily predict it would be subject to in a normal office environment. Factor in the added solidity that comes from adding the optical drive to the machine, and you have a versatile little PC that you could potentially pop into your bag and take with you. But we still fail to see why you'd actually want to do such a thing, paying the full price of £595 / US$629 / AU$1,209, rather than just buying a laptop. The chassis is weighty and solid, and boasts a great slimmed down design that is certainly sober and functional, but attractive enough at the same time too. The presence of a Kensington lock will give you peace of mind from light fingers, too. There are enough USB ports to use the unit without having to reach for a USB hub to just get up and going. The raw power should, in theory at least, be more than enough to handle any serious work you'd want to put the machine to. The reality is somewhat different though, and in practice we found the Lenovo M92p Tiny sluggish, prone to crashing, and generally one of the most negative user experiences we've had the misfortune of sitting in front of. The decision to install a 32-bit operating system in this day and age is odd at best, and just downright limiting in reality. Having access to less than 2GB of RAM certainly doesn't help matters here, either. The fact that there is a relatively small hard drive for your applications and data is a missed opportunity, too. Mini PCs represent a niche in any market, but the argument for them in the workspace isn't at all straightforward. Here we'd be more likely to back the concept of an all-in-one PC over a system like this, just because it's a neater overall solution. If you have specific screen needs, then we could see an argument for something like this, but if you have a big screen, you probably want better performance than this system can muster. The real problem is that laptops are available for the same cash as this, and offer much more in the way of flexibility for any office situation. If you really want a workhorse of a machine, you either need a proper desktop computer, or a better laptop. This barely gets a look in.